Last fall, I produced a video on YouTube introducing the starting lineup for the season finale at Homestead. 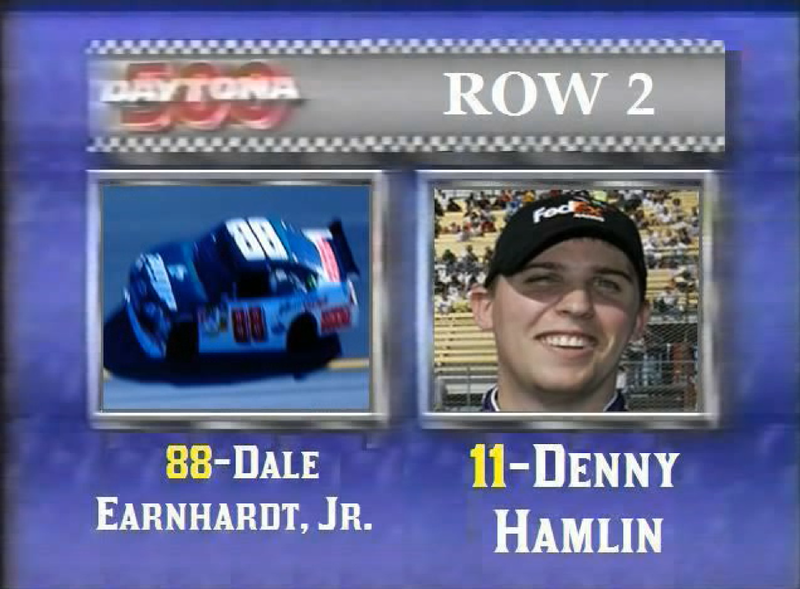 Next month, I will set the lineup again for the Daytona 500, marking the tenth anniversary of the first such video I ever made. I'd planned on simply telling the story of those videos. But when I started writing it out, the more I found it tied to other NASCAR-related projects I've done over the years, and other things that have happened in my life. It ended up turning into an autobiography covering the last few years. It wasn't my intention, but these things happen in writing sometimes. I’ve followed NASCAR since I was eight, and for much of that time, my favorite part was when the announcer introduced the starting lineup. I admired the artistry of CBS’ Ken Squier and ESPN’s Bob Jenkins, among others, who built up the anticipation by walking me through the grid one row at a time. The graphics, the music, and the clever way of conveying information, including what each car in the field looked like, always stayed with me. It was still with me in late 2005, when I was at a crossroads in my own career. A year out of college, I was working in retail and trying to figure out what I wanted to do in life. In between shifts, I escaped into my passion for both NASCAR and creative writing, trying my best to mesh the two together. I began this journey too late to take advantage of internships in college, and getting into journalism school proved as difficult as getting into law school. Looking to follow my father’s footsteps into law, I’d applied to eight different schools, only to be rejected from all of them. Like so many others my age, I looked to the internet for a chance to make something out of my passion. It was the start of a journey that continues to this day. It started in February 2006 with my first blog, where I wrote poems that reviewed what happened in each Cup Series race. The working title was “NASCAR Tourette’s.” I wasn't intending to make light of the condition; I only considered it because it was the nickname my college roommates gave me for yelling at my TV each Sunday. For obvious reasons, I changed the name to “Karaoke for NASCAR Fans,” or KFNF. The logo for "Karaoke for NASCAR Fans." In place of poems, which I didn't really have a passion for, KFNF turned into giving songs the Weird Al treatment, like musical race reviews. My thought was, with iPods as popular as they were, this could be a way for fans to follow the season’s action along with their playlists. I enjoyed the effort it took to twist everything from Queen’s “Bicycle Race” to Tennessee Ernie Ford’s “Sixteen Tons” into something understandable. The biggest fans of KFNF, as it turned out, were Dennis Michelson and Lori Munro, co-hosts of the weekly “Doin’ Donuts” radio show on RaceTalkRadio.com (RTR). In late 2006, I became a regular guest on their show, where I would sing my lyrics over the phone. This was a challenge I should have expected, but hadn’t. I couldn’t sing a note, and I’d always imagined other people would sing them instead. It was also a logistical challenge – it was impossible to sync up a backing track over the phone. But Dennis and Lori were always good sports about it. KFNF never found an audience outside of RTR, receiving double-digit hits for each time-consuming article. After two and a half years of weekly updates and a declining music selection, I shut it down. A new race review segment grew organically from RTR, called “Barney and Me.” This time, during my weekly appearances, I would do a pretend play-by-play of each Cup Series race, speaking half of the lines by impersonating the late Barney Hall. Once again, I was working outside my comfort zone – impersonations were no more my “bread and butter” than singing – but I enjoyed writing the skits, and the segment was a hit on the show. I even produced a “Barney and Me” Christmas Special called “The Sleighbell Showdown,” where “Barney” and myself called a race among Santa’s reindeer. The clip is still in the RTR archives. I was a regular guest on “Doin’ Donuts” for nearly five years, and Dennis and Lori have been good friends of mine ever since. It was my first exposure to live broadcasting, and I soon joined the hosts in discussing topics from week to week. Years earlier, I’d always dreaded any kind of performance, from recitals to school presentations. I’d thought about taking a class on stage fright. After RTR, it didn't seem necessary. In early 2007, I looked into a third option – producing a NASCAR children’s book. My objective was to create an illustrated NASCAR history book with big, multi-colored drawings of key moments in the sport’s history. I’d done something similar in 2001, where I made little doodles of key moments during the Cup Series season in pen and colored pencil. I’d made similar doodles on KFNF, as well as a chalkboard-painted door in my parent’s garage, where I drew the cars my brother and I picked for our fantasy racing league. In the children’s book, my drawings represented different exciting aspects of the sport: first-time winners, photo finishes, and famous races. What started as random collages turned into more creative pictures, including one of a garbage can dumping out drawings of some of NASCAR’s most spectacular crashes and a bowl of “Champions” cereal where different Cup Series champion-winning cars were represented by car-shaped marshmallows. After writing a couple lines on each picture, I submitted copies of the manuscript to NASCAR at the end of the 2007 season. I never heard anything back. Once again, there was much learned from the experience. Prior to the book, I’d only been interested in the part of NASCAR history I remembered growing up, from 1988 to the present day. The project forced me to dig deeper and gain a better appreciation for the sport’s early years, and moments that weren’t talked about as much. Though the book stalled, I felt that I left it with a better understanding of NASCAR itself. When the book fell through, I did have a “Plan B,” – or, I guess, “D.” With the 50th Annual Daytona 500 coming up the next February, I thought it would be fun to make a starting grid video of my own to introduce the lineup. I’d grown dissatisfied with the grids used on the post-2001 networks, which I felt the producers treated as an afterthought. I particularly didn’t like how the grids didn’t even show the cars (and still don't today). The grid idea had been coming together for some time. During my KFNF years, I’d even found the song CBS used for their lineup in 1990 and 1991 – “Las Vegas,” Hans Zimmer’s track from the soundtrack to “Rain Man.” There was just one problem: I had no idea how to make a video. My current YouTube channel was registered in 2006 under my old AOL handle “nadeau1064,” which I picked when I was a card-carrying member of the Jerry Nadeau Fan Club. By early 2008, the channel featured a series of NASCAR clips that are laughable by today’s standards. I didn’t know anything about video editing or DVD ripping, so when I wanted to upload a clip, I just pointed my digital camera at my computer screen, turned the volume all the way up, and hoped no one walked into the room. Those fuzzy clips are still on the channel today. One clip of Jeff Gordon was even used in a video made by the Sonoma Raceway. My computer at the time was an old laptop I’d had since I went to college in 2001, a bulky Compaq Presario with a nearly square screen. Heading into SpeedWeeks 2008, the computer was overheating constantly, requiring a USB-powered cool mat to keep it from shutting down. But it was on this computer that I made my first NASCAR Starting Grid, as well as every other video I posted into early 2009. It still runs today, and in 2015 was used in my short-lived “Fantasy Racing Series” on YouTube. The first starting grid format, using the 1988 CBS template. While clicking around one night, I found a screenshot someone else posted from the 1988 Daytona 500 starting grid, as it aired on CBS. I saved the picture and examined the video on YouTube. Looking at it critically, I realized that the grid “animation” back then was more of a slideshow than a video, so all I needed to do was alter an image one part at a time, then arrange them in the right order. While I was taking a class on Photoshop at the time, I didn’t have that program at first. Instead, I used MS Paint, and made a template out of the screenshot. The best font I had at the time was “Kristy,” which I felt was bold and clear enough to use on the video. Driver photos were easy enough to gather with a Google search, though some were better than others. The picture I used for Tony Stewart showed him scowling at someone across the garage. Car photos, however, were going to be a challenge. Again, I didn’t know anything about making my own screencaps or even how to record something on TV, so I relied on what had served me on YouTube – the digital camera. And so, on the day of Pole Qualifying for the Daytona 500, I sat hunched in front of my TV, finger on the shutter, and manually snapped pictures of every car during their lap. These pictures were then cropped to fit my template and sorted out. While the driver pictures fit the template well, I mistakenly scrunched the car photos to fit, making each car look like a Volkswagen. While I fixed that cropping issue soon after, I would continue to use the camera this way for the next four seasons. This was often the most stressful aspect of making the grids, as oftentimes the broadcasts didn’t show every car. This was also the time where full-season sponsorships were becoming a thing of a past, requiring that I keep a massive catalog of paint schemes. After Thursday’s qualifying races, I took out a sheet of binder paper, wrote the numbers “1” to “22” down the margin, and filled in the starting order on either side of each number. The rest of the sheet would be used to take notes during the race, something I had started for a new blog that would debut alongside my video. This site, “43 Stories,” would each week feature an annotated full-race rundown with notes on what happened to every driver in the race. The idea, which has since been replicated on other sites, was another imperfect one. No matter how complete my notes were, there were always two or three drivers without any notes. That site, too, would fall by the wayside after just one season. It was simply too much work for an unsatisfactory product. Thanks to my experience on RaceTalkRadio.com, narrating the video seemed a whole lot easier than singing a silly song or playing two different people on-air. I’d picked up a cheap video editor and a headset microphone with a rubber mic arm that slowly bent into my mouth every couple of minutes. After pulling “Las Vegas” into the editor and pulling up my script, fresh off the printer, I hit the “record” button and started my call in a low, even voice. It took a number of takes, but I was finally happy enough with the result. I then found out that editing the template took much longer than I thought, and I was up well after midnight changing the text one frame at a time, making sure the drivers, cars, and rows matched perfectly. I had a monthly calendar commemorating the 50th 500, which I took another picture of and used for the opening image. 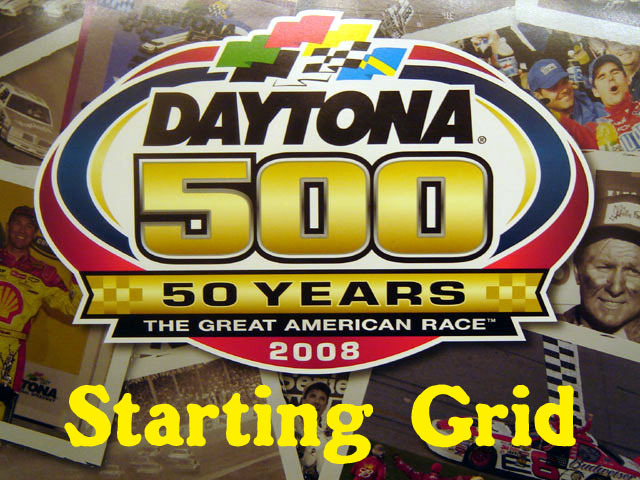 Another bold font, “Gorilla,” was used for the “Starting Grid” text. Putting the edited pictures into the editor was much easier, just lining them up with beats in the recording, using crossfades like those used in 2008. By keeping much of each screen the same and changing just one thing, the result came out better than I expected. In the early morning hours of February 15, 2008, the video went live on YouTube to mostly good reviews. To date, it remains far and away my most popular starting grid, though even ten years later, it still has less than 40,000 hits. At the time I posted the grid, I was out of work, and unsure of how much further these videos would take me. All I did know from previous experience was that, if something happened, it wouldn’t happen right away. With that, I decided to re-apply to law school. When I got into John F. Kennedy University in nearby Pleasant Hill, the plan was to keep doing the grid videos on the side. Whichever of the two careers took off first would be the direction I would go. I thought it was a good idea at the time. If I’d learned one thing at that time, it was that nothing was a guarantee. And so, I continued to make Starting Grid videos each week for the Cup Series through my graduation from JFKU in 2011. As with my previous experiments, I figured out ways to improve the format one week at a time. I converted the videos to widescreen in 2009, picked up a copy of Photoshop, and began dropping in video clips. I started recording qualifying sessions, practice, and followed the sport closer than I had before. Knowing that these videos had a limited shelf life up to the start of each race, I tried to increase their re-watch value by making skits and montages. My videos for the Toyota / Save Mart 350 were played on the buses Hunt’s Race World chartered to the race. “Brock’s Starting Grid Network,” or “BSGN,” seemed to be headed the right direction. The first season in review video, fast-forwarded to Metallica's "Fuel." 2009 Daytona 500 "Super Bowl Spot"
SpeedWeeks was always circled on my calendar. This first of three yearly hype videos for the 500 was probably my best. It was also made on the old Compaq Presario. Even though the Brickyard 400 had fallen in popularity, I always enjoyed hyping the race. The opening boils down the clinch scenarios for various drivers, heading into the final race before the Chase. I wanted to open this video with Stone Phillips' clip from "The Colbert Report" where he said "Warning: The images you're about to see - are awesome." I couldn't find it in time. In a throwback to the children's book, I hand-drew the opening image and spliced in clips of putting it together. I liked to get creative with the formats I used. Here, I introduced the All-Star field in a format reminiscent of Racing Champions' old trading cards. A solid Bristol hype video to a cover of "You Spin Me Round (Like A Record)." Harvick vs. Hamlin vs. Johnson, with a retrospective on their careers. By 2011, I had expanded my SpeedWeeks coverage to both the Budweiser Shootout and both Gatorade Duels. I was also considering Nationwide and Truck grids. We found these stock car shaped cookie cutters, and my mother had the idea to make the entire entry list for the Daytona 500 with frosting. 2011's became the foundation for the grid. All the commercials used in the opening were played during NASCAR broadcasts in 2011. These montages became a yearly feature, none bigger - and more obnoxious - than this one. The only XFINITY Series race I did, including memorable moments at the Circuit Gilles Villeneuve. But the views simply weren’t there. Not only had the hits dropped to just a few thousand, no matter how much work I put into any one video, but they showed no signs of going back up. Some of this, I felt, was due to bad luck. In 2008, 10 of the 36 races run had qualifying rained-out, including three in a row in the fall. Thus, several grids in a row differed little from one another, and I couldn’t obtain accurate car photos, undermining my effort to use them as a way to inform fans. In 2009, I attempted a fan petition to get Regan Smith voted into the All-Star Race, months after his win at Talladega was taken away due to the “yellow-line rule.” After spreading the word and even producing a video, it was revealed that Furniture Row Racing, who he drove for at the time, wasn’t even entered in the race. In 2010, I was hired by Frontstretch.com to follow the teams on the verge of falling out of the Top 35 in Owner Points. It was a fun job, and gave me my first chance at working trackside. The site also showed interest in posting my starting grid videos. At first, e-mailing the files to be re-posted cost more money than I was making, but I didn't mind because I was gaining experience. Unfortunately, the effort was snake-bit by a non-Frontstretch person who recommended I apply to the site in the first place. Calling himself "Alex," this person misled me into believing he was a PR agent for Larry Gunselman’s team. Eager to make connections, I believed him – until he started asking for money. When this person then started harassing my editor, I decided to leave Frontstretch at season's end. But all this paled in comparison to what happened in 2011. While fighting to get BSGN off the ground, I had graduated from law school and taken the California BAR Exam in late July 2011. Results were set to be posted online on Friday, November 18, two days before the season-ending Ford 400 at Homestead. That year’s Chase – and that season – had been a thrill, complete with first-time winners (including Regan Smith), wild finishes, and by November, a near dead-heat between Tony Stewart and Carl Edwards for the championship. All of it was reported on BSGN in some of the best grids I’d yet made, complete with clips from practice and qualifying. But, even then, the hits just didn’t go anywhere. As I awaited the results from the BAR, I threw all my eggs into the Homestead basket. I produced a hype video to post earlier in the week, featuring all the action from the season. I blended together roof cam shots from every race to use in the grid’s credits. I selected clips for every driver in the field to play in the background of each row – even the teams which weren’t likely to qualify. It would also include one of my most popular running gags at the time, where I meshed clips of Christopher Nolan’s “Inception” with David Stremme’s team “Inception Motorsports." I even left a space open after the opening where I would reveal my passing the BAR, something I’d talked about on the channel earlier that summer. After all, I remember being “cautiously optimistic” after the exam. I still don’t like using that expression. Because, on Friday night, I learned that I failed the BAR. When I received the news, the 2011 Ford 400 grid was already more than halfway done. I decided to finish it, though my heart wasn’t in it. Things weren’t the same after that. I retook the BAR that spring, during which time I went cold turkey on all things NASCAR. The exam was held on three consecutive days in late February, starting on Tuesday, February 28, 2012. This, you may recall, was the time the Daytona 500 was rain delayed until Monday night. Staying at a hotel for the exam, I had to keep the television off, even when someone texted me about “did you see that fire in the race?” I didn’t watch a second of it until well after the test was over. It was the right decision. Again, I was confident I had passed – I had nothing left when it was over. I slowly got back into my old rhythm, though without the BSGN grids. I did, however, enter a contest on SPEED Channel where fans submitted a clip introducing their favorite driver in the race. Remembering the failed Regan Smith promotion three years earlier, I decided to do a clip for Smith. To my surprise, my clip won, and to sweeten the pot, it would be played on Saturday, May 19 – one day after my BAR results came in. It was a chance to mend all fences. But I failed again. This time, I was about as close as you can get – 1424, a handful of multiple-choice questions short of a passing 1440. The next night, SPEED played my clip. Amazingly, they very nearly didn’t. Earlier that week, the channel aired my clip as a potential nominee, and someone else posted that clip on YouTube. When I shared the clip with SPEED, they thought I’d leaked the clip and threatened to disqualify me. The misunderstanding was barely corrected in time. Needless to say, it was hard to fully enjoy that moment. I made a third run at the BAR that fall, but my stamina was gone. I didn't realize it at the time, but it was a fight to get back there in July, and I was now dreading November. Once again, results day was the Friday before Homestead. Once again, I had failed, and this time by a bigger margin. I couldn’t do it to myself again, or to my family. I haven’t since. It may sound silly to say I was in a depression over some test, but I was. This was so much bigger than that. This was my career - maybe not my passion, but a career I'd always figured was perfect for me as a writer. I always thought I'd be in the legal field, that NASCAR would just be some hobby. Every attorney I knew - including my father - had a hobby they escaped into, whether it be art, hunting, or watching sports. I figured I wouldn't be any different. But I was. Now, the question was - what was I? All I knew was I just needed something – anything – to go right, if only to pull out of this funk. By January, I got tired of waiting. I decided to make something happen. I first turned to my blog, which had only been updated sporadically during that turbulent 2012. Years earlier, “43 Stories,” the blog where I annotated race reviews in 2008, revealed one curious thing to me. In each race result, I always had something to say about two drivers: the race winner and the last-place finisher. It made me think more about why that was the case, and what drew me just as much to the back of the field as the front. It was this moment that made me re-think how best to cover NASCAR. I renamed the blog “The 43rd Story,” and focused on the last-place finisher exclusively. At my brother’s suggestion, I went with a better name – LASTCAR. LASTCAR had received some praise those first few seasons, including a feature by NASCAR.com writer Mark Aumann that made the front page after the 2010 Daytona 500. Jayski followed the site, and started sharing my links. For the first few seasons, those articles were short as I struggled to find the right tone, and I provided very little information beyond my statistics. The readership remained small, growing slightly after I expanded from Cup coverage to Busch and Trucks in mid-2010. An attempt to expand to Formula One in late 2012 was met with no interest at all, so those features were quickly cut. Now, in 2013, there was a chance to rebuild the readership I’d lost during the last two runs at the BAR. I started by getting into self-publishing, if only to make a couple dollars on the side. I’d been thinking about expanding the LASTCAR brand by making my own history books, this time for all audiences instead of just children. That winter, I’d completed the first two books, chronicling the last-place history of Cup, Busch, and Truck Series competition. And, slowly, the books started to sell. Another two self-published books would join the library. I then looked toward a way of promoting these books, and looked back to BSGN. There were mixed feelings dusting off those old Photoshop files and audio equipment. It just didn’t feel right. But, the more I did it, the more I realized I needed to do it, if only to feel good about something again. 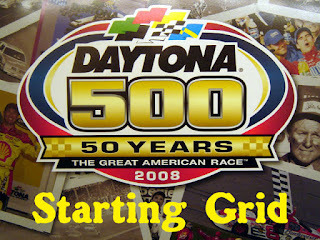 By race week, I would produce two new videos – a new “hype” video, using the theme of the “Daytona USA” video game, leading to the 2013 Daytona 500 grid. The grid used a template I had planned to use for the 2012 Daytona 500 before the BAR results came. The video still wasn’t a big hit, just like all the ones before it. But this time, that didn’t matter. I was just happy that Homestead 2011 wasn’t the last one I’d ever make. Then, that summer, came a real breakthrough. I’d made another “hype” video for the 25th annual running of the Toyota / Save Mart 350, which was coming up that June. I’d sent a copy to the track staff, who got back to me soon after. They said they enjoyed the video so much that they would play it during the pre-race on Sunday, and awarded my brother and I pit passes to the race. The video was well-received, and resulted in an internship where I helped the track promote that September’s FIA World Touring Car Championship weekend. More new friendships were made, and I now had a foothold to grow LASTCAR. Since 2013, I have made just five more starting grids. LASTCAR, meanwhile, has expanded to multiple features with a greater emphasis on the drivers and teams themselves. The last-place finish has become a framing device to tell stories that don't often get reported. We have now covered NASCAR events under our own name at both Sonoma and Darlington. And now, this July, my book on J.D. McDuffie – the only driver to have a feature written on him at both KFNF and LASTCAR – will go on sale from Waldorf Publishing. And, most importantly, I now have a new career in the medical field, where I register patients in the emergency room of a local hospital. At least two of my co-workers have LASTCAR.info shirts. In many ways, this journey has been a series of successful failures: while each project didn't go very far, the sum total has expanded my horizons. And that journey continues. LASTCAR.info is itself still a work in progress, just now beginning to make a name for itself. Many have asked me about my motivation for writing about last-place finishers and teams that struggle. To them, I can only say I’m no different. You do an amazing job on all you do for this work. I am also thankful you've allowed me to do my own section of LASTCAR on my YouTube league. Your journey has been amazing, Brock. I've watched your grids from the very beginning and still do to this very day including that Gatorade Duel 101 video which I've finally understood the format than I did three years ago. I even did a couple myself (2014 Ford EcoBoost 400 and 2015 Daytona 500), but your presentation is much better as I'm not graphic savvy. Out of all the YouTubers I've seen, you remain as one of my early and all-time favorites as a result. Starting grids was an crucial part of the race weekend experience back then and it's unfortunate they've become an afterthought. I've even brought it up on my NASCAR TV graphics analysis which I had my share of flak because this kind of stuff matters to me from a presentation standpoint. I've also struggled a lot on coming up with a unique idea and becoming a media personnel because covering auto racing is a passion of mine. With the intention of producing content on the race track. Last year was similar to your struggles with the BAR exam except it's getting into the business. I've been no-called, rejected (sometimes in less than 24 hours), ignored, etc. from various sports teams, race track, race teams, TV and radio, including NASCAR themselves. I wrote several racing articles for my site and struggled miserably to have my content noticed as a journeyman journalist. Some articles did well like my thoughts about Austin Cindric "dumping" Kaz Grala and Ron Hornaday going into the Hall of Fame, but it had little to no impressions. As a result, I work at two arenas as guest service and most days, I hate it because it's not what I planned to do after graduating from the University of Idaho last year. After Watkins Glen, it had gotten to the point I was depressed because it's my number one passion covering sports and the negatives almost killed my passion that I ended up not enjoying auto racing last year. This frustration led compiling every red flag in a Cup Series season. It was something I've become intrigued after the 2017 Brickyard 400 when there was three in a race and just said, I'll do it. Now, I plan on expanding on Xfinity, Trucks and IndyCar this year because it has become my calling. Sure the requests are ridiculous and it takes six hours putting the video together because I watch every race and see when they stopped the race. Like starting grids, red flag stats aren't emphasized a lot. Now entering Speedweeks, I'm about to start writing for Motorsports Tribune and hope this dream will become a reality where I can actually cover the races on track. Brock, you have been a key part of why I wanted to be a multimedia personnel and what you've done with LASTCAR has been incredible. It gives drivers some spotlight despite being on the other side of the grid and even follow their progress. Your never-die attitude inspires me and I'm looking forward to the J.D. McDuffie book this August. Keep up the good work and hope we cross paths someday. That's very kind of you both. Thank you for your support and best wishes in your own endeavors.